Should I pack horses or mules? Should I Pack Horses or Pack Mules? Pack mules are born followers. A pack mule will follow a horse or another mule almost anywhere. While some pack horses have a tendency to daydream and step off the trail, pack mules know exactly where they are going to put down each foot. Pack mules carry a load without a lot of swaying and lunging. Pound for pound, pack mules are tougher than pack horses. I never have to shoe my pack mules. I just keep them trimmed, which saves me money. Pack mules know their job and want to do it. 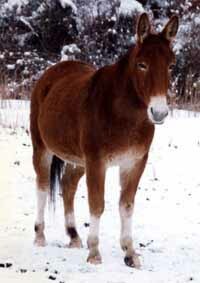 Pack mules generally have a 20-30% longer useful life than pack horses. Pack mules are easier keepers than pack horses for the most part. Last, but not least, they are cute.